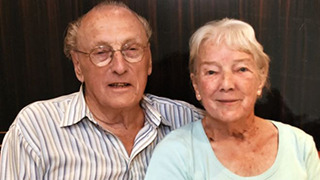 A 91-year-old man bought a $6,000 cruise holiday for himself and a stranger within minutes of meeting her in a UK pub. John Mason, from Hampshire, met Vera Burrell, 90, from Sudbury, Suffolk, when she stopped for lunch on a coach trip. Mason had asked to share a table with Burrell at a crowded pub, and a few minutes later he made the offer of a trip to the Mediterranean. His reason was practical: he needed a companion for his cruise because he was unable to read the ship’s cabin door numbers and menus. Mason took Burrell across the road to a travel agent before she re-boarded her coach to Bournemouth. He only told his four children what he had done when his bank phoned them to check the transaction. The pair said they have become friends after the 12-night voyage with P&O Cruises in October. The second time he saw his travelling companion was when he opened the door of their shared cabin on the cruise ship Azura a few weeks later. Mason insisted there was “no romance” involved, but he “couldn’t be more glad” about the time they shared. Burrell said she was “stunned into silence” by Mason’s offer. “Let’s face it, you don’t meet someone for 40 minutes and go on a cruise with them,” she said. That said, she is considering Mason’s proposal to go on another cruise next year, the BBC reported.